The 2012 Wisden Book of the Year Award has been won by Chris Waters for his superb biography of Fred Trueman. Fred Trueman: The Authorised Biography , published by Aurum Press, was released last October to glowing reviews. Author and Mail on Sunday columnist Leo McKinstry, regarded himself as an oustanding sports biographer, described it as “one of the finest sports books of recent years”, while the distinguished veteran journalist and cricket author David Foot called it a “brilliant and unsparing portrait”. The winner was chosen by Harry Pearson, the columnist and author, whose book Slipless in Settle last year won the MCC-Cricket Society Book of the Year Award for which Fred Trueman: The Authorised Biography is also a contender. The winner of the 2012 award is due to be announced this evening. The book, Waters’s first and a project he undertook with painstaking thoroughness, has also been short-listed for Cricket Book of the Year at the British Sports Book Awards, to be announced next month. Since 2003, the Wisden Cricketers' Almanack has named a Book of the Year, selected by their guest book reviewer, representing a personal view of the best new cricket book seen during the year. 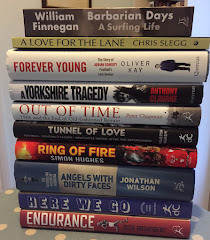 Coming soon: spotlight on all the contenders for Cricket Book of the Year.